The Philips CD-i is a multimedia CD player developed by Royal Philips Electronics and released in North America and Europe. As a video game console, it was one of the first to use a CD format for games. 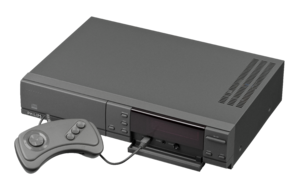 The CD-i was originally released in 1991 at the price of $700 in the United States, and was released in Europe the following year. Nintendo originally made a deal with Philips to develop an add-on for the Super Nintendo Entertainment System to allow it to play CD-based games, after a similar deal with Sony had fallen through. The project was later aborted, but Philips was given the license to use five of Nintendo's characters in games. Using Nintendo's licenses, Philips released three games for The Legend of Zelda series, one for the Mario franchise (two more were planned but were canceled), and a version of Tetris. The The Legend of Zelda and Mario games received very bad reception, and the system generally sold poorly after 1994. Common criticisms of the CD-i were its price, the graphical quality of its games (compared to the Super Nintendo or Sega Genesis), its poor library of games (including an influx of point and click games, pornographic games, and educational content), and the controls. Special criticism was used for the controllers of the CD-i. There were four main models of the controllers of the CD-i; a basic controller with three buttons and a D-pad (despite the fact that the console only used two buttons), another that resembled a spoon, another similar to the first one but with a protruding stick on top, and one resembling a TV remote, which was the one that came standard with all the consoles. None of the controllers featured a start button. In 1998, Philips announced that the CD-i had been discontinued. A Donkey Kong game was apparently in development for the system. The only known report of it is the LinkedIn resume of programmer Adrian Jackson-Jones, which states the game was in development during the 1992-1993 period at RSP. Jackson-Jones "designed and implemented the game engine" for the project. ↑ Heath, Shona (March 28, 2013). An interview with the creator of the CD-i Zelda games. Zelda Universe. Retrieved April 8, 2015. This page was last edited on April 6, 2018, at 17:07.